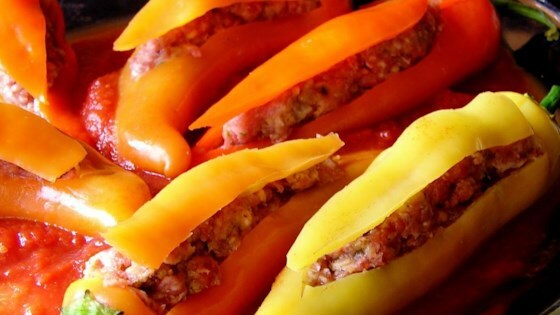 "This is an awesome recipe for banana peppers stuffed with an Italian sausage mixture and baked in a delicious tomato sauce. We get requests to make them for the guys my husband works with all the time." Cut off tops of peppers, and remove ribs and seeds. Chop edible portions of tops; set aside. Bring a large pot of salted water to a boil. Add peppers, reduce heat, and simmer until tender but still firm, about 5 minutes. Drain and set aside. Heat butter in a medium skillet. Saute reserved chopped pepper, onion and celery until tender, 3 to 5 minutes. Stir in crushed tomatoes, tomato sauce and garlic. Season with basil, oregano, 1 1/2 teaspoons salt and 1/4 teaspoon pepper. Simmer uncovered for 10 minutes. Preheat oven to 350 degrees F (175 degrees C). Meanwhile, in a large mixing bowl, combine egg, 1 teaspoon salt, 1/4 teaspoon pepper, Worcestershire sauce and Parmesan. Mix in hot sausage, mild sausage, bread crumbs and 1 cup of the tomato sauce mixture. Using a piping bag or sausage stuffer, fill each pepper with the meat mixture. Place in a 3 quart casserole dish, and pour remaining tomato sauce mixture over peppers. Bake uncovered in preheated oven for 1 hour. This simple technique makes stuffed peppers even more delicious.